Discover the delicious and healthy organic dessert, naturally free from lactose and gluten. The coconut creamy dessert can be enjoyed at any time of the day as a snack or dessert! 2 x 125g. - Ingredients: Water, coconut * (15%) (coconut *, thickener: guar gum *), raw cane sugar *, inulin * (* agave fiber), corn maltodextrin *, maltodextrin rice * , corn starch *, oil virgin coconut * (1.4%), tapioca maltodextrin, tapioca starch *, thickener: carob seed flour *, natural flavor of coconut *. - Manufactured in a facility that also processed nuts and soya! 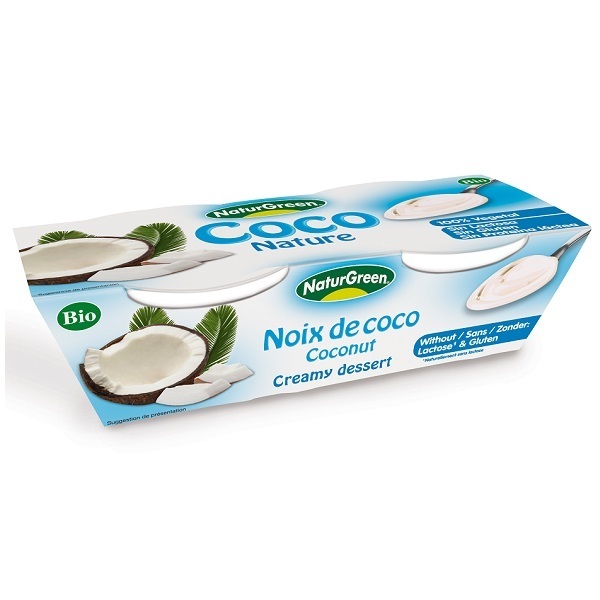 - Delicious creamy texture, sweet dessert that contains no diary product! - Gluten & wheat free! *This product is manufactured in a facility that also processes nuts and soya products! NaturGreen for a healthy & natural diet! NaturGreen develops its food and drink products exclusively with fresh vegetables, dried fruits, all ingredients of the highest quality.